I was born between eras and the generations of my family are widely spread. (A chain of middle-aged mothers.) It shows in my language. There are Victorian undertones. Not that I've picked up the habit of speaking in the repetitive imagery my parents used. Indeed, I've shrunk from it. But in the last few years I've got beyond smirking over their hackneyed turns of phrase, learned to set irritation aside and realise how rich with history their stock-in-hand similies were. My mother would come into an untidy room and complain it looked as if a bomb had hit it - and announce a blitz to put it right. 'Rich' did I say? Maybe I should have said 'burdened'. My father's comparisons sprang from an even earlier time - when women shone with pre-raphaelite beauty, there were no cars, agricultural life impinged still on the cities and everyone had servants. (Well, everyone who wasn't one!) How my father expected me to be beautiful, I don't know - for it's not easy to be graceful when one's wardrobe consists of crimplene cast-offs and gleanings from Church jumble sales. But he did. My father also thought anyone who paid attention, in how ever small a way, to personal appearance - was vain. Ear-rings . . . ear-rings! Only the morally depraved wore earings! (Those and actors playing pirates.) Mirrors . . . danger there! They were useful to men when shaving but only the vain looked in them otherwise. All in all, it was quite difficult to live up to his dreams. Impossible, really. Women were supposed to be effortlessly beautiful and if it didn't work quite like that, well . . . they ought to be. Beauty was supposed to come automatically, along with gender. If it didn't he was perplexed. (Oh how he was perplexed!) And women have long hair. Don't they? Well, they are are supposed to. It is their 'crowning glory'. Here he comes . . . "You look like a sack of potatoes with a string tied round the middle', "You look like Mad Margaret," (who?) "You look as if you have been dragged through a hedge backwards", "Be careful - or you'll frighten the horses,". And there were other things which simply had to be said whenever particular circumstances arose . . . "Nice weather for ducks," (rain) "Up tails all," (upon seeing ducks) "It's an ill wind," (when anything went wrong) "Brave souls," (and this is where I've been heading). "I think of those brave souls who would venture out on a night like this," (when closing the curtains on a cold and stormy winter's evening). I was going to call this post "Those Brave Souls" but, with it being so close to Remembrance Sunday, I thought it might be taken to mean soldiers who had died in battle . . . when all I'm thinking of is flowers. I don't much like flowers. 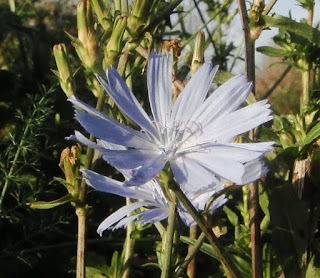 Chicory is an exception. I is the sprigged muslin of late summer and autumn rather than the chintz of spring blossoms and heavy density of June roses. 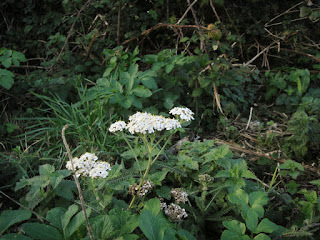 I'm pleased most flowers are over with for another year, and wanting to avoid bright berries . . . I went out to take photos of dead things . . . . . . to celebrate them. We make a lot of fuss about spring and I suspect those of us who can toddle up to the Co-op to buy chocolates and daffodils in bud get more joy from it than ever did our ancestors. For them, I think it must have been a time of desperate hope; their festivals tinged with fear. For anyone short of seed, it must have been terrifying. Everything eaten, nothing to sow. Autumn is the agricultural, horitcultural, and everything cultural destination . 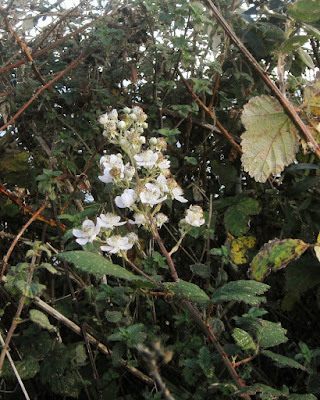 . . and the bushes where the blackberries have been picked are a sign that harvest has happened. The husks where seeds have fallen are a sigh of relief because the seeds were there to fall. But my post about these will have to happen another day now because I was way-laid by these 'Brave Souls' still flowering . . . despite the onset of wind and rain . . .
. . . beginning with the over-hopeful ones - like this blackberry, which has no chance that its flowers will come to fruition but there is is happily flowering in November. I admire its stength, its ambition, its determination to grow on to the bitter end. I think I'll take it as the symbol of the ancient mothers in my family who had their children in their forties and didn't care if they frightened the horses. There seems to be an almost unlimited supply of dandelion-style flowers. You're lucky this isn't a post full of ones like these - only with different shapes for their leaves. I could even be drawing your attention to the variety of petal endings. When I come home with my camera, I enlarge the photos on the computer screen and gaze into them and wonder . . . I mean, why are they so varied and so complicated and yet so regular. Daft! And it's not just dandelion type plants which bamboozle me - there are those too which I suppose to be in the groundsel family. I've not yet managed to take an interesting photo of groundsel itself. I think that says more about groundsel than my photography though. 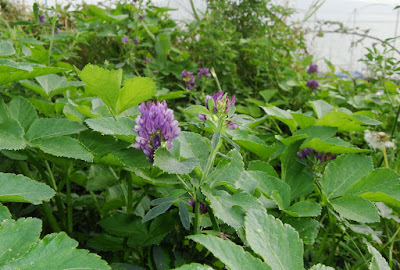 These plants in the picture are growing about eighteen inches high. 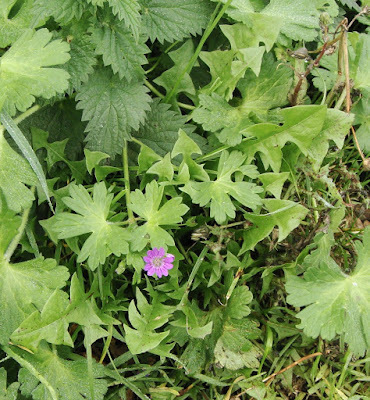 A low growing pink flower. Do not be deceived by the buddleia. The pink flower is on the top of a bank and the buddleia is growing up from lower down. Tops of trees and daisies are level partners here. And I'll finish with gorse. I don't have to finish. These aren't all the November plants which are flowering. But gorse is a good place to stop - because it doesn't! 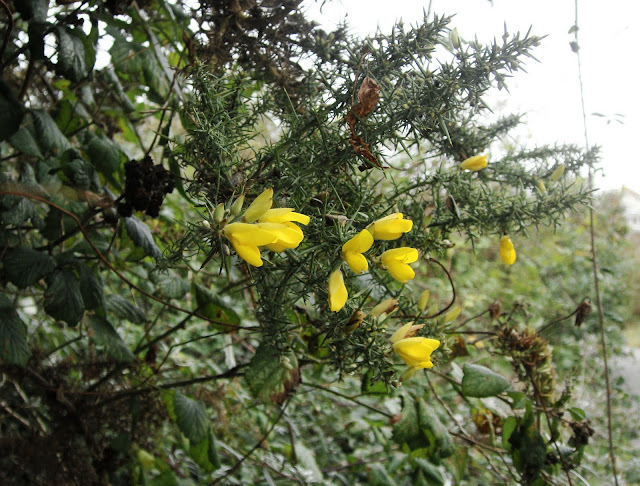 Is there a month when gorse doesn't flower? Gorse and blackberries . . . food and fuel and exceptionally pretty flowers (I reckon) . . . Hurray for autumn! P.S. All the photos in this post were taken on 29th October and 2nd November. Oh, how I love your blogs!!! BTW I had heard ALL those sayings. And thanks for becoming a Follower too. Ah, yes, the legacies our parents leave imprinted on us can be both burden and fond remembrance in one. I like flowers but I also like dead foliage. I like the whole cycle of life, as it were. And photographically, I do like a somber mood! You really made me think about where certain phrases we use from day to day come from. And will my children repeat them to their children? Thank you for a different view of plants. I enjoyed it. With all the fuss about Halloween and All Saints, it's good to remember 'All Souls' too. It's worth remembering / commemorating the inflences our very ordinary (as apart from saintly and fiendish!) forbears have had on us and the way we see the world. Loved reading your autumn post! It reminded me of what my parents used to say too--- but the essence was the same! Haven't had 'nice weather for ducks' for quite a while...The photo of the groundsel and those wispy clouds on a blue, blue sky is lovely! You're right about the dandelion types, there are indeed several in that category. If only there were Agave flowers looming above them! I loved this post Lucy. You and Esther both have a way of making us think that I really enjoy. Monica's comment expresses very well some of my thoughts while reading this post. I enjoyed the flower photos - unusual to see on one of your blogs. That said, I also really like that you seldom photograph flowers - one of the factors that makes your blogs so unique. This year one of my volunteer projects was growing some native plants and collecting the seeds for local ecosystem restoration projects. Being the first year, and since the plants started as seedlings this spring, most of them plants weren't mature enough to bloom. 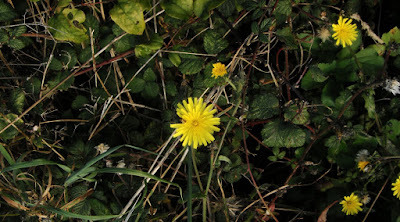 The hawkweed though, with its very dandelion-like flower, did bloom profusely and I was able to collect lots of seeds. Growing this plant this year made me aware of it all over our area, along with several other dandelion-like species. I never paid much attention to them before, and have been amazed how many different kinds of plants with dandelion-like blooms there are. I'm glad you liked the post, despite the flowers! 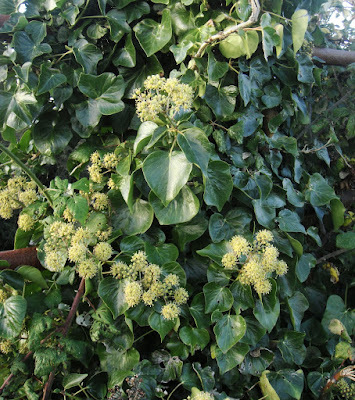 I hadn't planned to do a flowery post but was very much struck by the number of plants in the hedgerows which still have flowers, even buds, on them. Dandelions are extraordinary. The vibrancy of their yellow is intense and shines out brightly even from shade. 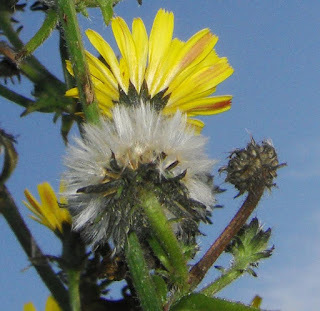 I've previously noticed the different shaped leaves of the Dandelion-like varieties but I hadn't previously paid attention to the different shapes at the end of the petals. I have to be careful not to go overboard about such things and realise there are more important things in life to be thinking about. (At least, there are in mine at present!) But it is, none the less, fascinating.